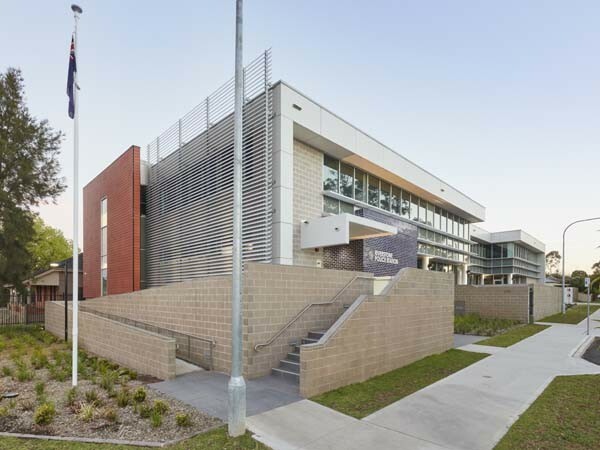 Surround, a highly versatile and durable prefinished cladding product from Cemintel™ was selected for the new Riverstone Police Station building developed to house the Quakers Hill Local Area Command. Typically, police buildings are designed in a regimented way in terms of layout, materials, furniture and colours. The new Riverstone Police Station project was, however, an exception, paving the way for a ‘new generation’ of stations across New South Wales. The new development needed to be strong and long lasting, and equipped to serve the growing local community well into the future. As a key public administration building in the area, it also needed to be an inviting and secure facility with a high quality and attractive finish, to meet the demands of modern policing. Project Architect for Gardner Wetherill, Lindsay Henry has worked on a number of New South Wales police stations in his career but says the Riverstone project really breaks the mould. When the design firm was engaged for the Riverstone project, the verbal briefing from the police sought to introduce a more vibrant, open-plan and user-friendly building for the Command to enjoy, while still undertaking their demanding daily operational roles. The Riverstone project is the first of the ‘new generation’ stations, and will be soon followed by Tweed Heads and Southern Highlands stations. Lindsay adds that New South Wales police are taking a much broader view of their new and future stations being more colourful, pleasant and enjoyable environments to visit and work within. Project Manager for Brookfield Global Integrated Solutions, representing New South Wales Police Property Group, Mr Dragan Sancanin, says one of the main objectives of the build was to make Riverstone Police Station a welcoming place for the staff as well as the community. He explained that existing Police Building Guidelines, until recently, were generally focused on using a relatively neutral colour palette and finish, keeping things muted and low-key. However, for Riverstone, they wanted to open the space up, dropping some of the enclosed offices and widening the corridors to make it a nicer facility to work in. The use of vibrant colours, new furniture and custom joinery makes the whole front of house friendlier, and is a welcome change from the earlier basic and utilitarian style. The project had its challenges too. According to Project Architect Lindsay Henry, the site was on the edge of a 100-year floodplain and adjoining a residential area, requiring them to be considerate and sensitive with their approach to design, acoustics and materials. The project called for durable external finishes to simply minimise ongoing maintenance issues. Looking for a cladding product that was smooth and modern, would not hold grime, and could be easily maintained, the design team found in Cemintel’s Surround, a highly versatile and durable material that achieved the design brief. As a prefinished, long-life cladding, Surround gives a contemporary and professional look that reflects the authority of the police station. According to Lindsay, the facade panelling is quite a strong element of the overall aesthetics. They wanted a ‘slick’ material that would colour contrast, but be visually compatible with the red terracotta tiled south wall, and also appear appropriate in a commercial-type setting; Cemintel’s cladding met all of these expectations. Lindsay added that Cemintel’s service, guidance and assistance during the design, development and application of the cladding on site was invaluable. He particularly appreciated the professional service rendered by the Cemintel team throughout the project from the design phase to the delivery and installation. The feedback received from the staff at Riverstone is that they really like the building’s ‘new generation’ appearance and appreciate the end result.